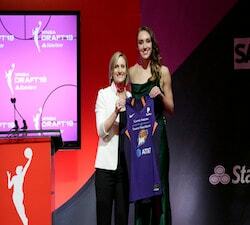 The three-time WNBA Champion Phoenix Mercury today acquired the 21st-overall pick (second round) in the 2018 WNBA Draft from the Connecticut Sun in exchange for forward Cayla George, the team has announced. 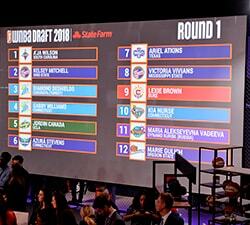 With the acquisition of the 21st pick, the Mercury now hold three selections in this year’s WNBA Draft. Phoenix currently owns the 8th-overall selection (first round), and will have back-to-back picks in the second round (20th and 21st-overall picks). 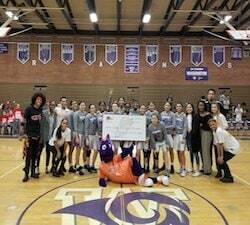 The Mercury has had success with past second round selections, drafting Leilani Mitchell with the 25th-overall pick in the 2008 WNBA Draft and selecting Adrian Williams with the 21st-overall pick in 2000. George was originally signed as a free agent by the Mercury on February 4, 2015. After missing the 2016 WNBA season to focus on the Summer Olympics, the 6-foot-4 forward again signed with Phoenix as a free agent on February 7, 2017. During her two years with the Mercury, George averaged 4.2 points and 2.9 rebounds and appeared in 66 of the possible 68 regular season games for which she was available.